Kindle is the perfect device for avid and passionate readers and travelers. Kindle makes the whole world of reading so pleasurable. 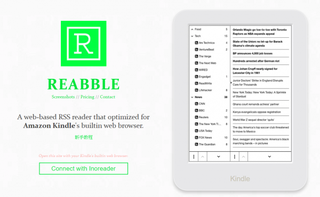 Kindle is a simple e-reading device but to make more functionable, Reabble is introduced which is a little RSS reader which is optimized to work inside the Kindle’s experimental browser to make the reading articles a simple task. A web-based RSS reader that is optimized for Amazon Kindle’s built in web browser, can also be used for other E-Ink devices. It simply gets placed into the RSS reader Inoreader and you can do your non-Kindle management from there. This isn’t an app or it is simply a website that you’ll point the Kindle browser to. It is optimized to look good on Kindle. One of the limitations this model is priced at 90¢/month if you want to read more than 15 articles a day. It’s just simple, all you need to tap on the article which you want to read. However, there are few other ways to send articles to your Kindle device but this RSS reader certainly makes things simple and easy.